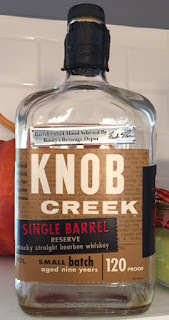 I feel like I start off every review of a Knob Creek Private Select the same way, touting the great value and the fact that for the price, you're guaranteed at the least a very good pour, if not a great pour. Well, here I am doing it again, because these Private Selects continue to not disappoint, no matter which one I grab. Binny's got in a bunch of barrels at once, and this was among the older of them, the oldest being a 13 1/2 year old. It didn't come recommended to me as with the last one, but how wrong could I really go hear? The nose is heavy, full of burn but also full of flavor. It was pungent cinnamon bread on the nose. I'd say cinnamon roll, but it didn't seem to have that sweetness. Rather, it was cinnamon and grain, leading to a very inviting nose. After being open a bit, the nose also developed a dark cherry scent that seemed to fit right in with the strong cinnamon and bread notes. The first sip I tried was an absolute cinnamon bomb, accompanied only by a heavy alcohol burn, which seemed to dissipate pretty quickly. There was also a significant amount of vanilla present, but it was dominated by the heavy dose of cinnamon on the tongue. After being open for a bit, it sweetened up significantly. Where before it was primarily cinnamon and unsweetened vanilla, it added a welcome bit of a honey flavor that went perfectly with the cereal and bread notes that were present throughout, though, much like the vanilla, were also dominated by the cinnamon notes. Towards the last few pours, the honey notes seemed to get stronger, as though they were fighting to compete with the cinnamon. Cinnamon and honey is not a combination that I would seek or would ever have even thought of as a good combination, but it certainly worked. This bottle carried heavy heat throughout, but not to the point where it turned me off. Rather, it helped with the complexity and the strong flavors. Based on the age of the bourbon and the nose, I had half expected to get some significant wood notes, but they were noticeably absent throughout. As someone who doesn't like anything more than just a little dry woodiness, this was a plus. All in all, this was a very good pour. While it didn't reach that greatness that some Private Selects I've had in the past have reached, it still didn't disappoint, and I enjoyed it from beginning to end!